A dime is equal to two nickels, a nickel is equal to five pennies. 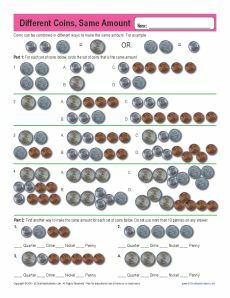 In this worksheet, your little one will identify equal amounts using actual coin images. While it's perfect for Common Core Standards for 2nd grade Measurement and Data, other students may also find it helpful.